Cupriavidus Metallidurans : The entire spectrum of Peter Bauhuis works, his jewellery and his vessels – you can explore all his pieces of rare beauty in our gallery. Peter Bauhuis is fascinated with the possibilities of founding. The central series of his work were made in metal founding. The intensive, often innovative engagement with this technique has earned Peter Bauhuis a reputation as modern alchemist. In contrast to wrought works that were forged the actual work in founding pieces lies within a thorough preparation. Technical precision and exact knowledge of the materials used predetermine the later results. However, once the founding has started, there are few possibilities left to correct or influence the outcome. The experiment with the process of founding and melting different metals together characterises the work of Peter Bauhuis. He reaches unexpected colours from matt white to a faint greenish yellow up to deep orange and dark red that seem to run into each other with the interplay of oxidising gold, silver and copper. People looking at his works, ask themselves: is this really metal? He integrates seeming mistakes like fine lines or cracks and technical necessities into his shapes. This gives metal and its strong materiality an incredible lightness. 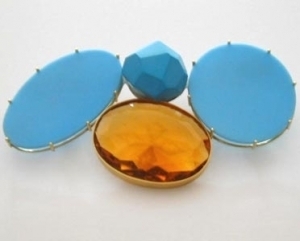 With wit and playful irony he questions the gestures of jewellery and the objects and how we are used to seeing things. Galerie Pilartz show the latest works by Mirjam Hiller, who has been honored with numerous awards and prizes. « At first there is a thought, a very vivid, three-dimensional thought of a form, a room that I can go into. I explore it and let it enchant me. I would like to grasp and experience it over and over again. The form is very complex, built of different colours, structures shapes and scents and depending from where I look, everything changes. Like an alchemist the Korean artist Eunmi Chun searches for the philosopher’s stone with her works of intestines and gold-plated hair. « The skin of the animal is breeding ground for the germinating seeds, from which gold-plated human hair is sprouting. These are images from the cycle of life; images of progress and decay. They deal with the fact that life carries on, incessantly and forever changing. With this exhibition we present jewellery artists whose works reveal the strength of art that can be worn as attire. 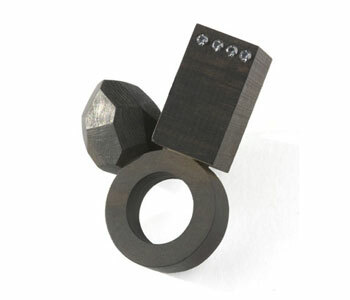 Gallery Pilartz now shows a collection of bracelets from jewellery artist Beate Eismann. In its genesis the computer plays a decisive role. The pieces were shown for the first time at the Grassi exhibition in 2010 at the Grassi Museum of Applied Arts in Leipzig, where they were awarded the Grassi prize. Four bracelets have been selected for the special exhibition Schmuck 2011 and will be on display at the International Crafts Fair in March 2011 in Munich. Beate Eismann was born in 1969 in Halle (Germany). 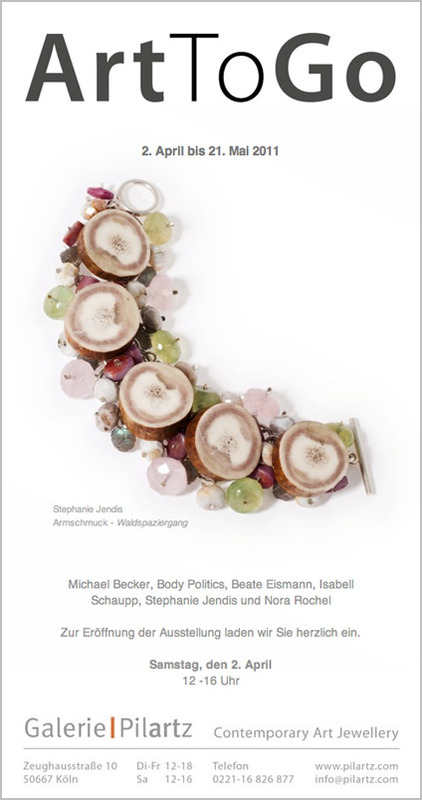 She is a graduate of the « Burg Giebichenstein School of Art and Design » in Halle, majoring in jewellery. Next to numerous stipends, teaching appointments and engagements as artist in residence, she also completed an education as CNC specialist. She uses her skills in computerized CNC production, such as lathing, milling or rapid prototyping, to make jewellery that she then works up using conventional goldsmithery techniques. Many young jewellery artists and designers experiment with computer techniques for their drafts or in order to produce a certain piece. Some of them develop computer programs on their own or cooperate with software designers to lay the groundwork for their jewellery drafts. With these programs they can generate forms, make sketches, work on photographs or alienate these. Furthermore, the computer is used for shaping itself by letting it steer the machines directly that produce a jewellery piece or work on it with laser cutting. 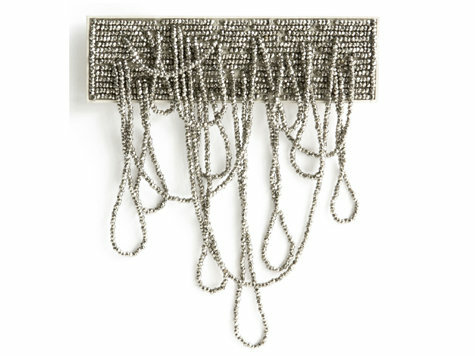 It is exactly these skills that Beate Eismann unites in her series of 15 bracelets, which she first presented to the public at the Grassi exhibition 2010. Since 2007, when she became a CNC specialist, she has been using this technology to design jewellery. The artistic application of industrial construction and production techniques and their combination with traditional manual crafts were at the centre of her interest from the very beginning. Beate Eismann manufactures models by rapid prototyping, i.e. making 3D prints. She then works on these using goldsmith techniques to make jewellery that in no way hides its basic industrial character. At the same time, it still shows the qualities of manual work and an artistic claim. Beate Eismann puts high-tech to use in the sense of a precise manual crafts methos – let her surprise you! Mirjam Hiller on her creative process: “At first there is a thought, a very vivid, three-dimensional thought of a form, a room that I can go into. I explore it and let it enchant me. I would like to grasp and experience it over and over again. The form is very complex, built of different colours, structures, shapes and scents and depending from where I look, everything changes. I bend and fold it to the third dimension. The juxtaposition of graphics and jewellery creates an extraordinary tension. Even if seen independently from the jewellery pieces that grow from them, the graphics emanate something autonomous, mysterious and leave a lot of room for the imagination. Its viewers come up with very different and intuitive associations: Are they motifs of Australian Aborigines? Are they drawings used to classify plants? Medical illustrations? Machinery construction plans? A city in a bird’s eye view? The graphics, from which her jewellery results, show very nicely how Mirjam Hiller’s thoughts on jewellery “unfold”. « Both artists have been born in Göttingen. It is 10 years ago, that they learned about the similarities of their jewellery. Both have been studying at renowned schools and both got several scholarships. Julie Mollenhauer studied at the Rietveld Academy in Amsterdam, where she is living now. She loves to work with antique glass beads in a very simple and classical way. Her bracelets come into existence as they move perfectly with the body. Sometimes her works consist of two sides, such as two contrasting colours or materials. « My work is often fragile and very flexible, especially those with tiny glass beads wich i use often for bracelets. I like the fact that bracelets more than other jewellry move and slip with the body.